Agar is a relatively cheap substance from red algae. And it contains a saccharide agarose as well as a small amount of pectin. 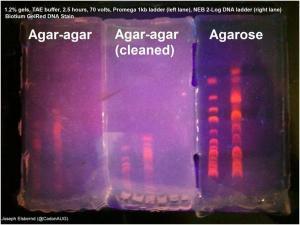 Agar is used for culture plates as is, but for DNA gels a grade of agarose, I guess with the pectin removed. What happens when a gel is run in agar? i.e. why remove the pectin? If you can guess, how is the pectin removed? I know there are enzymes that might do it, but not sure what's really used. Agar is a heterogeneous mixture of two classes of polysaccharide: agaropectin and agarose. Although both polysaccharide classes share the same galactose-based backbone, agaropectin is heavily modified with acidic side-groups, such as sulfate and pyruvate. The neutral charge and lower degree of chemical complexity of agarose make it less likely to interact with biomolecules, and, therefore, agarose has become the preferred matrix for work with proteins and nucleic acids. The second part of your question: here's a patent, although I have no idea whether this method of agarose purification is widespread. Propylene glycol purification of agarose does seem to pop up a lot. I think people who purify their own agarose use that method, but I am not sure if biotech companies have other methods. EDIT: it's propylene glycol, followed by ethylene glycol, that is commonly used, but PEG has been used at least once. Using DMSO (dimethyl sulfoxide), agarose can be separated. After heating and stirring around 2 hrs you will get a yellow stiff gel of agarose by filtering. Not the answer you're looking for? Browse other questions tagged molecular-biology lab-reagents or ask your own question. How realistic is to use DNA for long term storage? How do you obtain specific mRNA transcript levels for comparison from a Hi-Seq dataset?